This article describes facial nerve repair for facial paralysis. Paralysis of the facial nerve is a cause of significant functional and aesthetic compromise. Functional concerns primarily involve adequate protection of the eye, with a real risk of exposure keratitis if not properly addressed. In addition, swallowing, drooling, and speech difficulties may arise. The degree of suffering these patients feel, however, is often far greater than these functional problems alone would produce. Patients with facial paralysis, especially younger ones, may experience tremendous psychosocial distress about their condition. Poor self-image and difficulty interacting with peers and family members can be devastating. Repair of the facial nerve is generally a concern in cases of permanent complete facial paralysis. This may involve all or selected branches of the facial nerve. Congenital facial paralysis, as in the well-described although poorly understood Möbius syndrome, is uncommon. Idiopathic facial paralysis (Bell palsy) is the most common type. It is often thought to be due to virally induced inflammation of the nerve that results in functional compromise, swelling, and vascular compromise. Facial nerve repair is infrequently required, because most of these patients regain function spontaneously. When paralysis is permanent, some advocate facial nerve decompression in selected cases. This article focuses on cases requiring various nerve grafting techniques, rather than procedures of decompression. Traumatic facial paralysis (from blunt and penetrating trauma or intraoperative iatrogenic injury) is the next most common type. The site of facial nerve injury may be intracranial, intratemporal, or external to the stylomastoid foramen. Acoustic neuroma surgery is an example of a procedure that puts the facial nerve at risk (in the cerebellopontine angle, in this case). Any injury sites may be amenable to facial nerve repair, except for sites near the nerve’s root entry zone, where the available facial nerve stump may not be long enough to allow repair. Neoplastic causes of facial paralysis include tumors of the parotid gland, typically malignant. Facial nerve schwannomas, acoustic neuromas, and neoplasms of the brain are among the less common causes of facial paralysis. Inflammatory and infectious causes of facial paralysis can occur. Infectious agents implicated include virally mediated conditions such as herpes zoster (eg, Ramsey Hunt syndrome), mumps, Coxsackie virus, and mononucleosis. Bacterial infections include sequelae of otitis media and Lyme disease. Inflammatory causes of facial paralysis include sarcoidosis. Active research continues to find ways to improve the results of treating facial nerve injuries. These include advances in the molecular biology of nerve regeneration and improved techniques of repair. A variety of neurotrophic and neurotropic factors have been investigated for their effects on the facial nerve. In addition, humoral factors have been identified as having a role in facial nerve regeneration. Newer techniques proposed as possible alternatives to suture repair include laser neurorrhaphy and tissue adhesive repair. Synthetic and biologic tubules have been created to provide a path for the regenerating axons, even spanning small gaps in the nerve. Although these have not been clearly shown to be superior to standard nerve grafting techniques, they remain important areas of investigation. Facial nerve repair is an option for cases of facial paralysis in which there is no reasonable likelihood of spontaneous return of function. Essential in determining whether repair is indicated are the cause of the paralysis and the duration of time since the injury. In this regard, some general principles will be helpful. In general, transected nerves produce the best result when reapproximated. This produces an intact motor nerve supply from the facial motor nucleus in the pons to the muscle endpoint and is preferable whenever possible. If direct repair without tension is possible, it should be performed. Otherwise, a cable graft may be inserted to produce a tensionless coaptation of the proximal nerve stump to the distal branch or branches. Nerve crossover techniques are used when the proximal nerve stump is inadequate or inaccessible and cannot be used for grafting. Another simple rule of thumb is that the sooner an injured facial nerve can be repaired, the better the long-term result. Once regarded as somewhat controversial, this rule is now believed to hold true for most cases. In cases of trauma where the continuity of the nerve is in question, exploring within the first 3 days after injury is extremely desirable. Within this timeframe, the surgeon can use a nerve stimulator intraoperatively to identify the branches of the facial nerve. Once degeneration has occurred, stimulation of the nerve is not possible, and identifying the branches in an inflamed field can be extremely difficult. Fibrosis of the nerve, fibrosis of the motor endplate, and atrophy of the muscle all ensue after injury. The surgeon is in a race against this inevitable process. Thus, a repair performed 18 months after the onset of paralysis is sure to have a poorer chance of success than a repair performed in the first month after injury. Waiting may be appropriate in specific instances, depending on the health of the patient, oncologic surveillance issues, and other concerns. Nonetheless, when possible, maximizing the patients’ chance of a satisfactory outcome is desirable. In such cases, it is worthwhile to consider alternatives to facial nerve repair, such as facial reanimation procedures. In addition, patient-specific factors influence clinical decision-making. In an elderly patient, slower nerve regeneration is expected, and the result of repair is likely to be poorer than could be achieved in a younger patient. If the patient’s life expectancy is short, one may elect to perform an adjunctive procedure that produces an immediate improvement (eg, a dynamic muscle sling) rather than a nerve repair that, even in the best of circumstances, takes some time to yield results. Repair of the facial nerve is contraindicated when the motor endplate muscle unit is no longer functional. This occurs after long-standing paralysis in which fibrosis develops along with atrophy of the facial musculature. In such instances, reinnervation is not successful. The motor endplate muscle unit may fuse in cases of long-standing paralysis (ie, >1-1.5 years). Electrophysiologic testing can help determine whether this has occurred. Advanced patient age is considered a relative contraindication by some. Anecdotal evidence suggests that the results of reinnervation techniques are poorer in elderly patients. The nerve regenerates more slowly, and results ultimately are not as good as those achieved with procedures performed on younger patients. Planned radiation therapy is not a contraindication to facial nerve repair. Regeneration of nerve function has been demonstrated despite subsequent ablative doses of radiation. Facial nerve repair may be contraindicated in other situations. These would include instances when the patient’s general health status prevents elective surgery. Surgical anatomy of facial nerve and relevant anatomic landmarks. 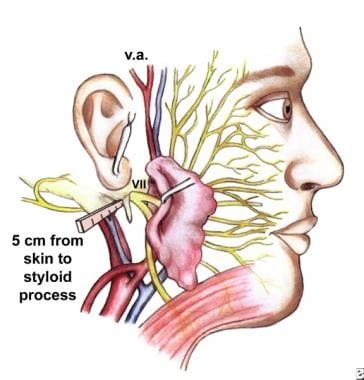 The intratemporal portion of the facial nerve begins as the nerve enters the internal acoustic meatus and includes the well-described meatal, labyrinthine, tympanic, and vertical segments. The nerve then exits the stylomastoid foramen and soon divides at the pes anserinus. The subsequent branching to the temporal, zygomatic, buccal, marginal mandibular, and cervical branches shows some variability from person to person. The blood supply to the facial nerve begins with the middle cerebral artery supplying the motor cortex. The facial nucleus in the pons is supplied by the anterior inferior cerebellar artery and the short and long circumferential arteries. The facial nerve proper is then supplied by the anterior inferior cerebellar artery, the middle meningeal artery, and the stylomastoid branch of the postauricular artery. These tend to overlap; however, the region just proximal to the geniculate ganglion is thought to be somewhat susceptible to vascular compromise secondary to the poorer redundancy present there compared with other areas. After significant injury, the facial nerve undergoes degeneration of the distal segment, as described by Waller. Sunderland classified such injuries into 5 types or degrees. These 5 types describe the pathophysiologic events associated with each of the disorders that may affect the nerve. First-degree injury is referred to as neurapraxia, in which a physiologic block is produced by increased intraneural pressure (such as may be produced by external compression). The covering layers of the nerve (ie, endoneurium, perineurium, and epineurium) are not disrupted, and the nerve is capable of stimulation. Full return of function without synkinesis is observed. Second-degree injury involves a similar mechanism, but the compression is unrelieved and results in degeneration of the nerve axons. This injury is termed axonotmesis, and again, excellent return is expected, though recovery may take several months. Because nerve stimulation is compromised, distinguishing axonotmesis is difficult. Third- through fifth-degree injuries involve loss of endoneurial, perineurial, and epineurial tubes, respectively. Fourth- and fifth-degree injuries imply partial or complete transection of the nerve. Regeneration is incomplete, and synkinesis is inevitable. Repair of the facial nerve is generally performed in cases of complete paralysis. After facial nerve repair, residual weakness and synkinesis are guaranteed. A House-Brackman grade III is the best possible result. Certain factors, including older age at time of repair, long grafts, and extended delay between time of injury and repair appear to limit the functional outcome of repair. The vast majority of patients experience improved symmetry and tone after primary nerve repair or cable nerve grafting. More than 90% have better tone and symmetry after hypoglossal facial crossover. Training is required to help these patients learn to produce a smile by stimulating the hypoglossal nerve. Chan JY, Byrne PJ. Management of facial paralysis in the 21st century. Facial Plast Surg. 2011 Aug. 27(4):346-57. [Medline]. Julian GG, Hoffmann JF, Shelton C. Surgical rehabilitation of facial nerve paralysis. Otolaryngol Clin North Am. 1997 Oct. 30(5):701-26. [Medline]. Terzis JK, Karypidis D. Outcomes of direct muscle neurotisation in adult facial paralysis. J Plast Reconstr Aesthet Surg. 2011 Feb. 64(2):174-84. [Medline]. Boahene KD, Farrag TY, Ishii L, Byrne PJ. Minimally invasive temporalis tendon transposition. Arch Facial Plast Surg. 2011 Jan-Feb. 13(1):8-13. [Medline]. Byrne PJ, Kim M, Boahene K, Millar J, Moe K. Temporalis tendon transfer as part of a comprehensive approach to facial reanimation. Arch Facial Plast Surg. 2007 Jul-Aug. 9(4):234-41. [Medline]. May M, Schaitkin B. The Facial Nerve. 2nd ed. New York, NY:. Thieme Medical Publishers. 2000. Hammerschlag PE. Facial reanimation with jump interpositional graft hypoglossal facial anastomosis and hypoglossal facial anastomosis: evolution in management of facial paralysis. Laryngoscope. 1999 Feb. 109(2 Pt 2 Su 90):1-23. [Medline]. Malik TH, Kelly G, Ahmed A, Saeed SR, Ramsden RT. A comparison of surgical techniques used in dynamic reanimation of the paralyzed face. Otol Neurotol. 2005 Mar. 26(2):284-91. [Medline]. Lal D, Hetzler LT, Sharma N, Wurster RD, Marzo SJ, Jones KJ, et al. Electrical stimulation facilitates rat facial nerve recovery from a crush injury. Otolaryngol Head Neck Surg. 2008 Jul. 139(1):68-73. [Medline]. Barras FM, Kuntzer T, Zurn AD, Pasche P. Local delivery of glial cell line-derived neurotrophic factor improves facial nerve regeneration after late repair. Laryngoscope. 2009 Mar 5. 119(5):846-855. [Medline]. Grosheva M, Guntinas-Lichius O, Arnhold S, Skouras E, Kuerten S, Streppel M, et al. Bone marrow-derived mesenchymal stem cell transplantation does not improve quality of muscle reinnervation or recovery of motor function after facial nerve transection in rats. Biol Chem. 2008 Jul. 389(7):873-88. [Medline].